Contact Me for all your Chimney Needs. When you’re looking for a chimney sweep in Derby, you want to be sure you get somebody who does the job right. So here is a brief breakdown of how a Derby chimney sweep should tackle the cleaning of your chimney. Your chimney sweep may use one of many methods, but there are two more common methods. The bottom-up method involves the sweep cleaning your chimney from the fireplace end, which is the preferred method by many. Rods can be added to the brush to reach the top as needed, and this method is generally faster – and cleaner! This is because when cleaning from the bottom up, the fireplace can be sealed off to prevent soot from falling into your living room. If your Derby chimney sweep offers you a choice, opt for the bottom up method which allows him or her to seal off the fireplace area and clean from the bottom of the chimney. Although there is often a little more legwork involved, it means there is less chance of getting soot on your carpet. Cleaning from the top down is done under exceptional circumstances. It tends to be messier and involve more cost as it means going on the roof. Can I clean my chimney myself? The steps listed above are so you know what you might expect – cleaning chimneys is difficult though, and you shouldn’t use the above steps to attempt cleaning your chimney yourself. 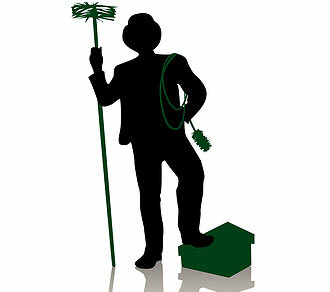 If you are prepared to learn in great detail how to clean your chimney safely, then by all means go ahead – but if you want the best result without having to spend a long time learning, you need a professional Derby chimney sweep to help you – one who has already done the training and has years of experience under his or her belt. © 2013 Chimney Sweep Derby - All rights reserved.